The media (and some firefighters) would have you believe that all wildfires are huge and catastrophic, requiring heroic efforts by men and machines to prevent flames from ravaging everything we hold dear. I have not had the fortune to be called to one of those fires. Mostly I get to work on ones like this, creeping around in the woods and occasionally causing excitement. 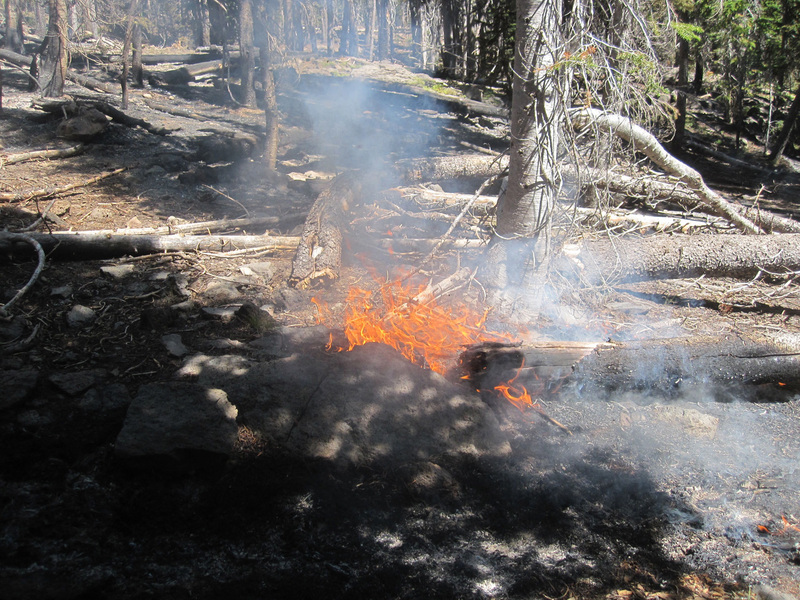 Fires can be described by quantifiable attributes, such as flame length and rate of spread. The flame lengths in the photo are about two feet at most, and the rate of spread is maybe a few feet per day. The smoldering and creeping progresses through the organic litter on the forest floor(dry needles and twigs), now and then getting into a down log. 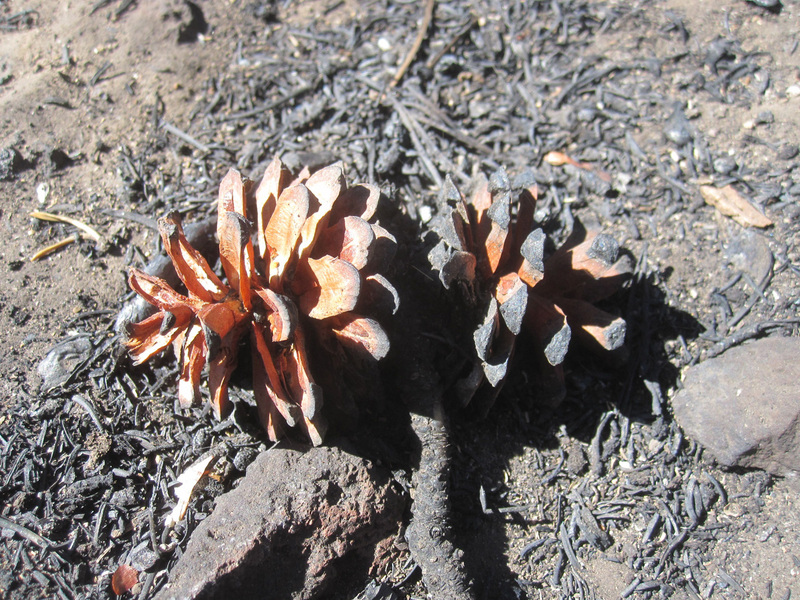 As I walked through and around the High Lake fire, I found evidence of a past fire in partially burned logs lying on the ground. Many of the logs rotting into the soil probably fell after the previous fire. Some of them were much larger than trees currently growing in this stand–probably venerable old whitebark pines. My conclusion is that the fire that burns right now is the latest in a succession of periodic fires that renew the forest. In a cool area, I found these lodgepole pine cones sprung open from the heat with their seeds lying on the receptive ground. Not far from here, I watched a Douglas squirrel climb a subalpine fir to harvest a cone then carry it down the tree and bound off to its secret cone cache. It made numerous trips–the industrious creature. 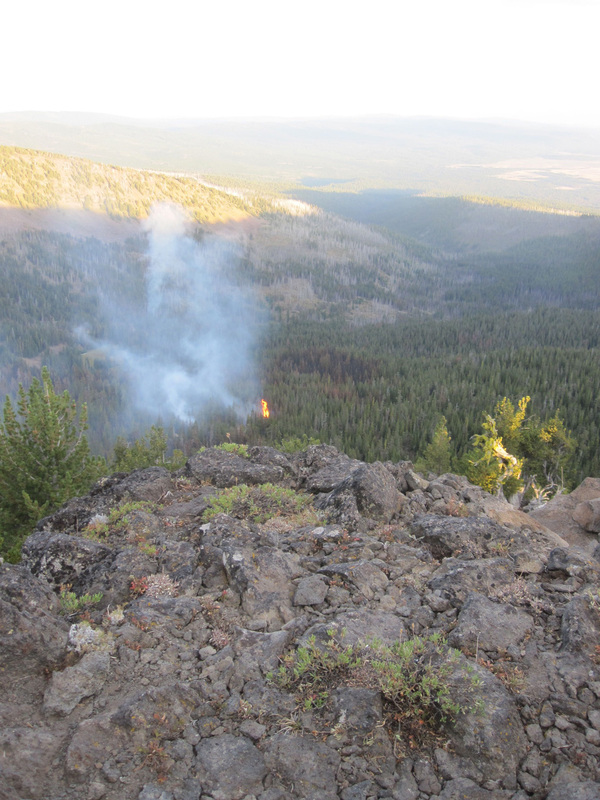 Late one afternoon we watched the fire bloom into the crowns of trees, and a spot fire started near the ridge. Precipitous terrain separates the High Lake fire from Strawberry Lake, but a spark from the spot fire on the ridge could possibly roll down. Local land managers did not want fire in the valley because it is a popular destination for visitors. I wonder how they intend to keep fire out forever–someday it will burn. But not this day. Reinforcements arrived. 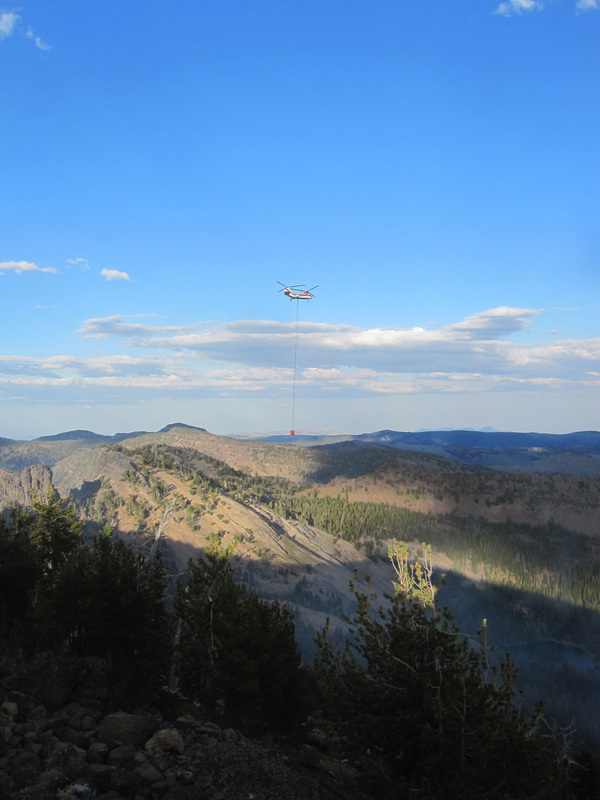 Zero Charlie Hotel dropped many buckets of water dipped from High Lake onto the ridge and drowned the flames. Then he disappeared into the sunset, leaving the air quiet after the clatter of rotors and roar of engines. 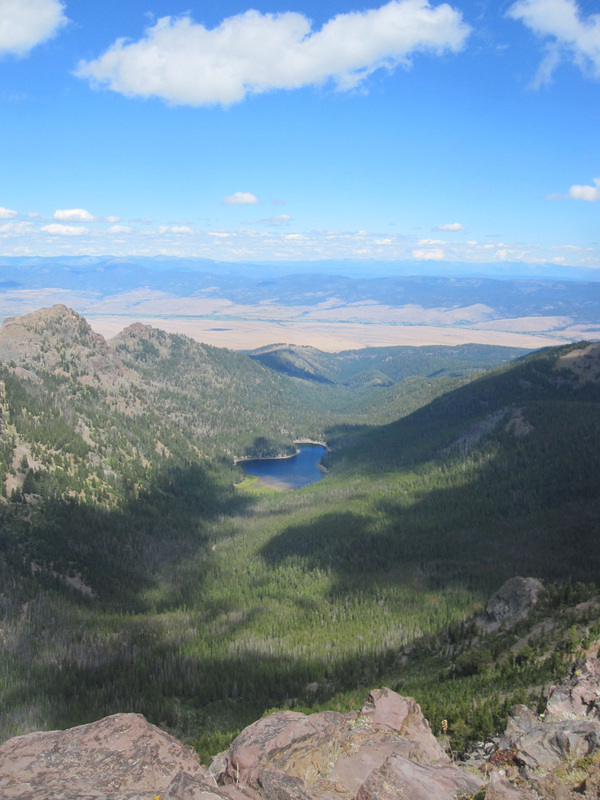 Strawberry Lake is safe for now although in the absence of cleansing fire, mountain pine beetle is beginning to ravage the lodgepole pines. They will die, creating fuel for the fire that will inevitably come. Yesterday we went back to check the spot fire (dead and cold, half washed off the hill by thousands of gallons of water). Walked down through the burned area, fascinated as always by this process. I stopped to watch smoldering for thirty minutes. It’s combustion without flames, moving through the fuel without consuming it completely. Smoke rises in little wisps and the area is definitely hot. The rate of spread was two inches per hour, backing downhill into the upslope wind. The Blue Mountains are in a long drought, and fuels are still very dry. Puffs of dust rise up around my boots with each step. Skin tightens over the bones of my face–I am windburned and parched. But the daylight hours grow shorter, and the burning period decreases a little each day. These are not the long midsummer days of July. Sometime in September, a big cold wet storm will come and even the smoldering can’t continue. Nobody knows exactly when fire season will end, only that it will end in the foreseeable future. In spite of the dry, I found gentians poking blue fingers from the ground. 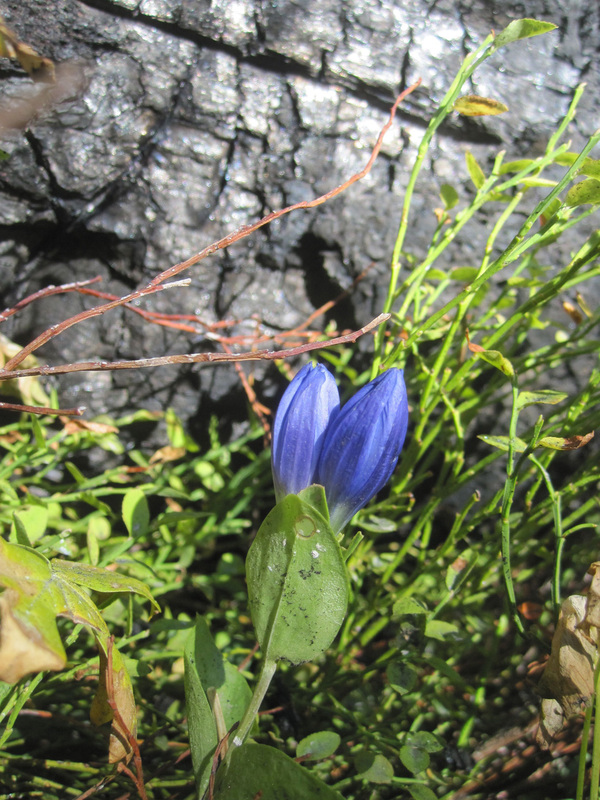 Just as the purple grass widows are harbingers of spring in the sagebrush country, gentians are harbingers of autumn in the high country. Their inky blue appearance means that September will arrive tomorrow, and when the buds open it will be early fall. Today was Day 10. Day 14 is for going home. Great pictures. Missed the mountains this year for a new knee. Back next year if the other doesn’t go. Bill, I hope your knee is healing well. The mountains missed you. See you out there next season. Hi Susan, thanks for reading and recommending the blog to others. I’ll check out the Wenatche eRiver Institute for classes. Happy Trails!